As Mick McCarthy continues, in vain, with his plan to find fresh recruits for the Irish cause, the national team manager learned in the last 24 hours that he has to plan without one of his most trusted and loyal servants as Stephen Ward has retired from international football. 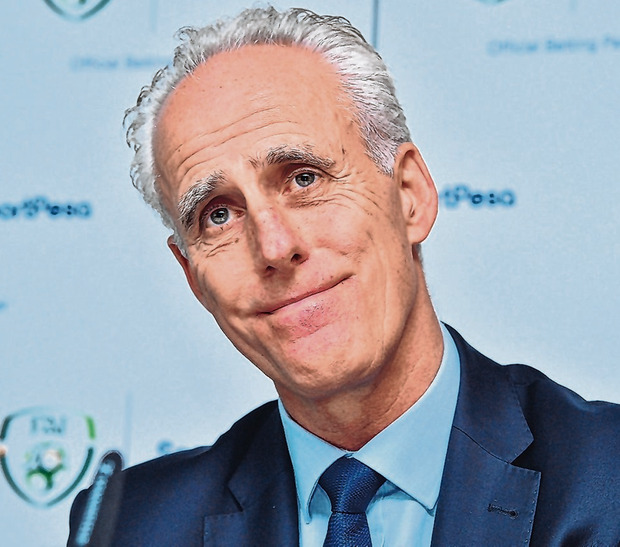 With the first test of his second spell as Ireland manager on the horizon, away to Gibraltar on Saturday week, McCarthy was in Dublin yesterday doing yet more promotional work for his employers. James McCarthy, without a game for club or country in 14 months, has conceded defeat in his fitness battle, though some (likely) raised eyebrows from his wife since the arrival of a newborn last week ended any suggestion that the Everton man could come over to Dublin to just train with the squad. Stalwarts like Aiden McGeady and David Meyler were left out, as were players who came through under Martin O’Neill (Scott Hogan, Shaun and Derrick Williams, Aiden O’Brien, Daryl Horgan) and Pádraig Amond also failed to make the cut. Alan Browne and Ronan Curtis were included but McCarthy does not expect them to be available, Curtis suffering the pain of a finger amputation earlier this week, the result of an accident at his Portsmouth home when his finger got caught in a door. “He’s had it amputated 80 per cent, they said. I just felt really bad for him because he’s had a great season,” said McCarthy. The trail on Patrick Bamford appears to have gone cold already, the striker telling McCarthy that he wants to “concentrate” on his club form for now. McCarthy had named veteran Ward in his provisional squad but the Burnley player later contacted the Ireland boss to inform him of his decision to quit. “I have spoken to him today and he is finished. He has told me he’s retired from international football,” McCarthy said. Ward, capped 50 times, will be heading towards his 36th birthday when the Euro 2020 finals come to Dublin and he says that even the lure of playing in his native city in a major finals could not tempt him to stay on, as age, time, injuries and family commitments all caught up with him. “It’s with a heavy heart that I do this, retiring from the Ireland team was something I never wanted to do but this was just the right time. “At this stage of my career, at this age and where I am at, I just need to make this decision,” Ward said last night. “I have been incredibly proud to play for my country but I have travelled a lot over the years and been away from my family. “My family have been in Birmingham while I was in Burnley and that’s not been easy so this will be better for me family-wise, I missed out on a lot of time with them and sometimes you make a decision for your family’s sake,” added Ward, who hopes to play at club level for at least another year. He insists the row over his leaked WhatsApp message last year was not the catalyst for his exit. “Maybe the WhatsApp thing would always come up once I was around the squad but that’s not the reason I have made this decision. “That was just something that happened, it was a mistake on my part and it’s forgotten about, it was never an issue in this decision,” he said. With Browne and Curtis to drop out of the squad, McCarthy is considering replacements, with Josh Cullen a potential addition.